Whether your cystinosis journey has just begun or you've been living with the disease for a long time, understanding what's going on in the body can help. Cystinosis is a rare, genetic disease. It's caused by a buildup of cystine. This buildup causes crystals to form and harm the body. Learn the basic facts about the disease and how to manage it. Cystinosis is a rare disease that affects about 500 to 600 children and adults in the United States. Cystinosis is a genetic disorder, which means a person is born with it. It occurs when both parents pass down a specific gene that doesn’t work right. 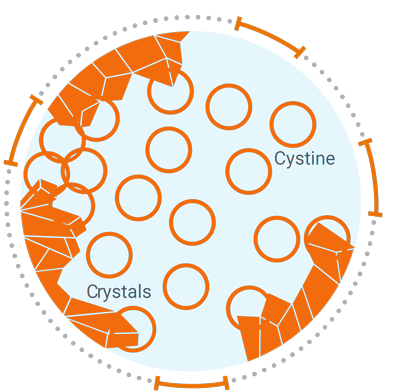 In people with cystinosis an amino acid called cystine gets trapped inside the cells, builds up, and forms crystals. People with cystinosis cannot feel the rise in cystine levels. But over time, the buildup of crystals causes damage to every cell and organ in the body. Signs of damage usually start in the kidneys and eyes. Damage cannot be undone but it can be slowed down. Keeping cystine levels low is the main way to slow this damage. Current treatments for cystinosis are called cystine-depleting therapies, or CDTs. CDTs help keep cystine levels low by removing cystine. If a dose is delayed or missed, cystine levels can rise very quickly, which may lead to damage in the future. So it’s important to take the dose your doctor recommends on time, every time. Work with your healthcare team and your doctor to schedule routine cystine level tests. Cystine level tests measure the amount of cystine in your cells. They also help your doctor make sure you’re getting the right amount of cystine-depleting therapy. Careful planning with your healthcare team and routine tests can help with the management of your cystinosis. Nephropathic or classic infantile cystinosis is the most common form of the disease. It is also the most serious. About 95% of people with cystinosis have this type. Symptoms usually appear early in the first year of life, and it's a lifelong disease. Intermediate or juvenile cystinosis is a less serious form of the disease. It may not be diagnosed until a person is a teenager. Ocular or nonnephropathic cystinosis is the least serious form of the disease and only affects the eyes. Cystinosis isn't something you can catch from another person. It's a genetic condition, which means a child is born with it. A child can get cystinosis if both parents are carriers of the disease. A child gets cystinosis when the specific gene that doesn't work right is passed down from both parents. When two carriers have a child, there is a 25% chance that the child will have cystinosis and a 50% chance of the child being a carrier. In people with cystinosis, cystine gets trapped in the cells. This causes cystine levels to rise. When cystine levels rise, crystals form that lead to harm to the body. Human cells are like little factories in the body. They do a lot of work to help keep the body healthy. But in people with cystinosis, a part of the cell called the "lysosome" doesn't work right. 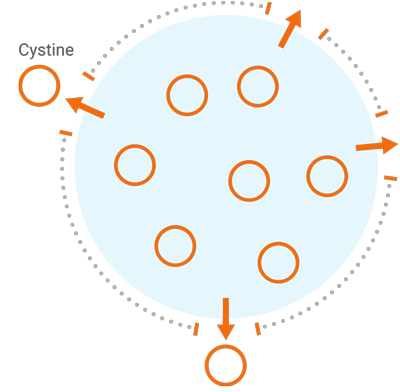 cystine is removed from the lysosome and used normally. Cystinosis harms the body little by little over time. This means that new cystinosis issues can appear at different ages. Cystinosis can also progress differently in each person. The age when new damage appears can be different for every person. The amount of damage to the body and the rate at which it occurs is related to how well a person manages his or her condition. Share this information with family and friends. You can also share it with your doctor when you talk about the best way to manage cystinosis. Join our community, and we'll send information about living with cystinosis to your inbox. Cystinosis United is owned by or licensed to Horizon. All other referenced trademarks are the property of their respective owners. All rights reserved. ©2018 Horizon Pharma USA, Inc. The information provided in this site is intended only for residents of the United States. The health information contained herein is provided for educational purposes only and is not intended to replace discussions with a healthcare provider. You are leaving CystinosisUnited.com You will be redirected to a website that is operated by an independent third party. This link is provided solely for your convenience. You are leaving CystinosisUnited.com You are about to go to a website that is sponsored by Horizon Pharma. Would you like to continue? You are leaving CystinosisUnited.com You will be directed to a product website to learn more about a medicine for cystinosis.